I love traveling when I get where I’m going but the travel itself… That I could skip. Give me a pill and wake me when we get there. My ankles swell beyond recognition and my skin dries out so that I arrive at my destination resembling a raisin. I stayed awake on the train to Florence and promptly fell asleep again as soon as I sat down at our accommodation. So the tiredness won but thankfully the raisin face is a thing of the past. Luckily for me I’ve been schooled on in-flight skin care by those in the know. I take my make-up off. I hydrate, then I hydrate and after that I hydrate before I apply a new face of make-up. Pure bliss. Clinique moisture surge face spray is my Bff on a long haul flight as is moisture surge thirst relief. I slather that stuff on like my life depends upon it. Even the flight attendants comment on how fresh I look at the end of the flight. Serendipity came into play when the day before we flew out Clinique had their bonus offer. 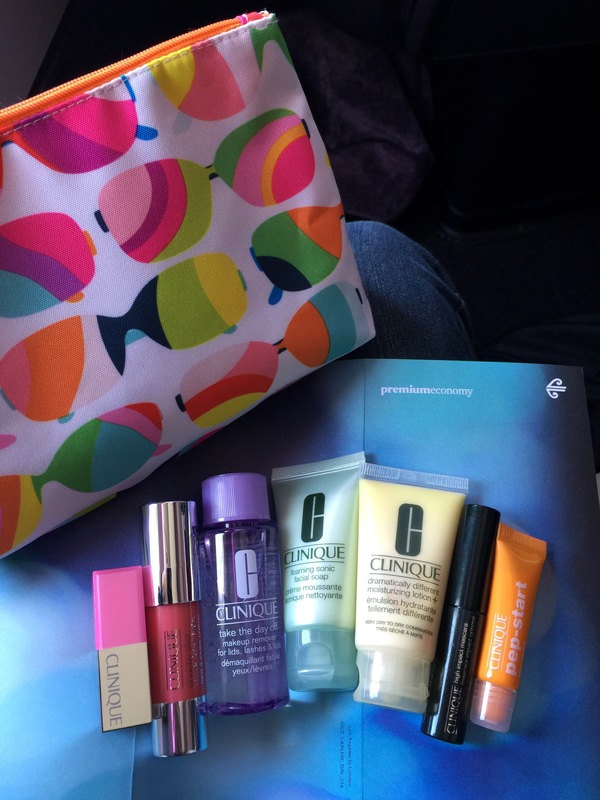 I needed a new mascara and I always need more moisture surge so I was able to bring a new bag of tricks on the plane in the form of mini products to try.